My mom the knitter and I did our review of projects at hand, and concluded we'd be remiss if we didn't pop into the local yarn shop. Knitters Logic, its right near the eye doctor she's on her way to, if we take the long way home. I'm in the car, pronto. The shop sells all kinds of wonderful yarn and yet neither of us ever leaves with much of it. Even when its on sale. Even when we enter with a mission. Its like some force overcomes us and we devolve while inside. We are weakened jellyfish upon departure. Being crazy optimists, we keep going back. This time we figured out what's wrong. The place is a mess. Its visual overload. Our brains can't sort it out. We get fatigued. There's yarn everywhere but no space to look at it in. The cubbies aren't organized logically. You have to ask the three people at the table knitting to get up everytime you want to go by them, or skip half the shop. We feel awful because one of them is, like, nine and a half months pregnant. She probably needs to finish a baby blanket to trigger labor and who wants to stop her? The other one has a big pile of yarn that falls over each pass, increasing our sense of dread. You are forced to tell the owner what you're looking for, which in my case is inarticulate half-thoughts such as"ummmm, I think I want something merino-ish - it could be chunky or worsted- like a Malabrigo but I know you don't sell that but really, its not that I'm set on that, I just want,ummm, nothing too fussy, kind of blue but not navy and not powder...kind of natural, not scratchy..." and then she starts showing you her idea of what she thinks you want. That's when the Flight Instinct kicks in, because now I have to explain to her why I'm rejecting her taste in knitting in her store, as she brings me fluffy mohair-ish skeins in just the shades I don't want. I left with one skein of Noro Korchoran and some dpns to gift a knitting friend. And a feeling of needing a cup of strong coffee really really badly. 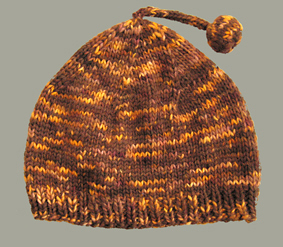 The pattern was a hybrid of several, the ribbing is a knitted in double weight hem for extra ear coverage. 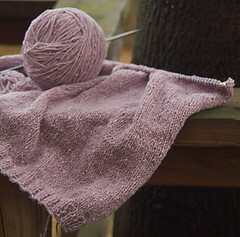 The yarn, Misti Alpaca Chunky, is heavenly to knit. Even my icy hands got warm working it. 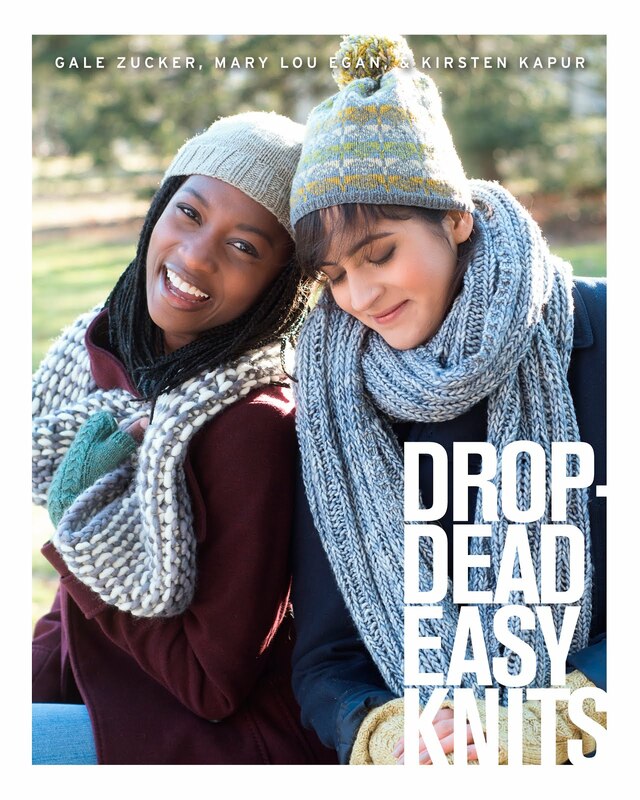 Not for you southern knitters. I started a hat for myself- I just can't stop hatting . I can never figure out what weight is a thick & thin yarn - do you judge it by its skinny parts or its fluffy fat ones? Or take an average? In this case I made the classic mistake of starting something too late at night and insisting that it was the yarn's fault- not mine- that it was coming out strangely. This morning , I realized I'd taken into consideration the ball band suggestion for size 5 needles , except it was 5european (which should have been 8us). I cast on accordingly,as if it were a lighter weight yarn, thus having one inch of a king kong size hat on the needles. Rip. V2, tonight. Ennervating yarn store aside, it was a lovely visit to DC and environs, incuding my first time at this place, the new Smithsonian Museum of the American Indian. There was a Navajo woman demonstrating spinning and carding churro yarn , and natural dyes, but my sons spotted her ahead and literally hustled me by, one on each arm, to another area. My guys, they know me too well, if I started to get into it with her, we'd have to skip the room with the gold, and evil weaponry. I mean really, where are my priorities? Oh yeah, priorities...next post. The last gift hat is ready to hit the road with us in the morning, when we head off to Washington/Maryland for the festivities. We've got chanukah, christmas and an anniversary to cover, and a slew of gatherings in the next couple days, so uncork the champagne and spin the dreidel. And car knitting! With no deadlines. I am so proud of this hat I could just pop. notes: why am I raving on this? 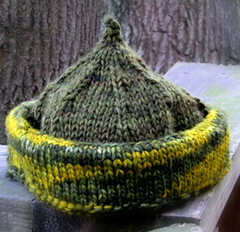 First, the brim covering your ears is double weight, in this case 4 strands of Malabrigo, because its a knit-in hem. So soft, so warm, so cushy. 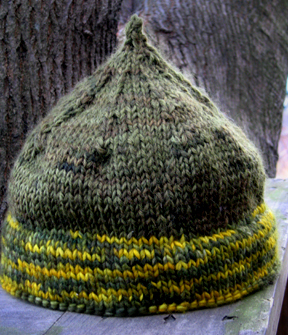 It looks finished and well made and solves that problem of knit hats never seeming to be warm enough for ears. The design lent itself to changing colors from the brim to the crown, a behaviour modification approach to get my variegated ya-ya's out in a way I can love. Or stand under. I am definitely making one of these for ME. When the brim is folded up, it sits like a hip little beanie. This one's going to my favorite bro-in-law, who sadly lost his last little hip beanie. I think he'll be happy. I'm sticking some chocolates in it so I'm hedging...but I don't think I really need to. I just like him that much. Whatever your persuasion, enjoy these days! As the dreidel says, keep an eye out for miracles. They're all around us. 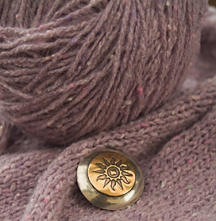 Knitting small projects for gifts. I'm on a hat jag. I could easily move to a scarf jag. Maybe even a neckwarmer jag. Winter is long. notes: when will I learn restraint with variegated yarn? It'll work for this artsy musician nephew but I invariably feelit looked better on the skein than on the object. what I learned: aside form the variegated thing? My first i-cord! And my first knitted ball. Good cheap entertainment. 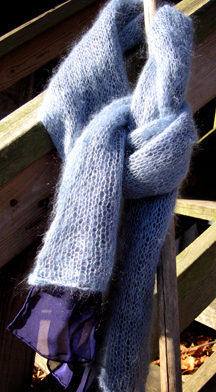 notes: when in doubt,or feeling frazzled, knit a tube of Kidsilk Haze . I tacked the silk to the knitting by sewing on a couple of freshwater pearls, so the inner layer didn't escape the tube. 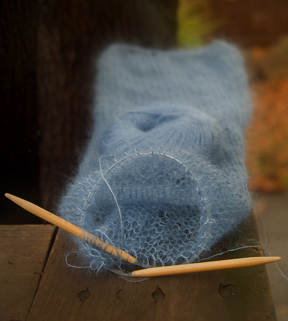 what I learned: An alternative bind off, using a darning needle. The knitting was a cinch. Finding silk by the yard? Not so much. The local fabric store had "silk like" fabric and I just couldn't see that happening next to the KidSilk. Upon further self examination, I wasn't up for hand hemming 60" of silk either. I found these wonderful people at Thai Silks who sent me gorgeous colored silk chiffon scarves. I wasn't sure what color was best and at $3. a piece - uh huh, thats really $3. each- I bought three to choose from. Someone else had already hemmed them. Now I have an orange and a light green silk scarf to tubify at my leisure. notes: I changed the pattern by lengthening the sleeves (the pattern came to just into the elbow), adding the colorwork, and increasing the width of the part that goes across the back, a little more coverage is good in the winter. My niece was openly coveting a shrug I made her mom, so I'm good here. If I'd read all the way through the pattern before I started it, I'd have known I was, essentially, knitting a very long 1x1 ribbed scarf with flared ends, then seaming up the arm sections. 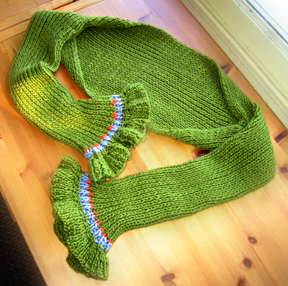 Wouldn't I have been happier starting and ending it on circulars and not seaming ? Oh yeah. Just as I finished seaming, I saw I'd done the color work slightly differntly on each sleeve, or we can say, each sleeve is subtley unique. I'd thought about writing it down as I did it but,well, you know. Another hat, in progress. Might be my favorite yet. Yes, that is more variegated Malabrigo on the bottom. I'm hopeless. 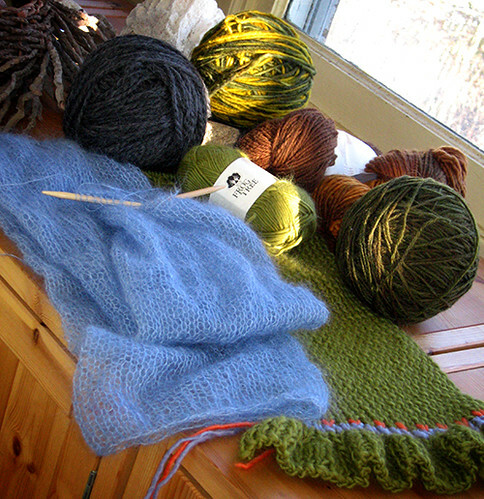 What you're looking at appears to be 2 WIPs and some yarn. Its actually a scarf, a shrug, and four different styles of hats. I'm not showing the mitts. Illusion or delusion? Check back when the dreidels fly. Sounds like a duck hunting trip. Not! distraction so I get the Sundance catalog. Curse them! This is the collection that started me on a three year binge of beaded jewelry making not so long ago. Its innocent enough , you page through it, admire the goods, the graphics, think " hmmm, I can make that, I'll just go grab me some turquoise and leather and silver teeny tiny beads..." next thing you know you're selling jewelry from a gallery and your family is constantly stepping on microscopic beads that got away but just kill when you're barefoot. I think we all agree it so much nicer to step on snips of yarn fluff. Which is all to say, there's Ann bravely leading her future search gang to perfection (you go girl, I'm with the group in the cocktail lounge but really...we support you!) and I see my own private (almost) perfection sweater,if I added a little shaping to the bod, there at Sundance . Go take a look, I would love patterns for half of these. Which brings me to decoy. Over Thanksgiving, my jolly houseful was pretty much a "Who's Who of Getting Handknits from Me Soon" so I resorted to decoy knitting and hid the gift yarn.